Egyptian Chronicles: #Ramadan Arabian Nights 2016 : King Rokn El-Zaman's tale "Ep.23"
And Omar Shah knew about old Shepherd Salman and his relation to Shoms and Prince Safwan. Tonight we will know if Omar Shah will really connect the dots or not in the 23rd episode of our tale this year, the tale of King Rokn El-Zaman and his family. You listen to the 78th episode of "One thousand and one night" show produced by the Egyptian State Radio after the break. Ex-Judge Omar Shah orders the prison guard to bring old Shepherd Salman from prison secretly to know his story and his connection to Prince Safwan. For his surprise , the old man told the ex-chief judge about how the King was imprisoned by evil vizier Samsem in an evil plot. Only one week away from crowning Prince Safwan as the new king of the Kingdom, evil vizier Samsem decides to take Safwan to dine at the Shahbander's house without telling him that his mother works there. Wicked Darkar is still jealous of Shoms and does not want Hassan to leave the island. 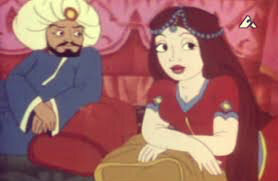 She will order Farkuk to bring Shoms to El-Salam island in order to know why the prince loves her so much.